The Denon wing in Paris's Musée du Louvre is home to La Gioconda (the Mona Lisa), as well as other art treasures. Venus de Milo and admirers. 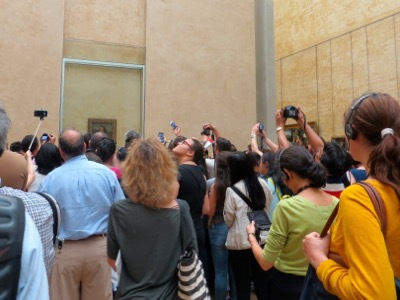 Most visitors to the Louvre will spend some time in the Denon wing because they want to see La Gioconda (Mona Lisa). It's a wonderful painting, but be aware that most of what you'll see is people taking selfies and pictures of the painting. But don't despair! There's lots more to see on your way to the world's most famous painting. There are more Da Vincis, such as the lovely La Belle Ferronniere, or Portrait of an Unknown Woman, beautiful Botticelli frescoes, and other fine Italian and Spanish paintings. In the same room with Mona is the enormous Wedding Feast at Cana, by Veronese. 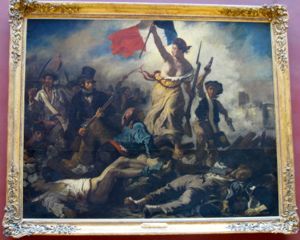 This includes painting by Delacroix, the most famous of which is Liberty Guiding the People (1830). There is also a section that's aptly named Large-Format French Paintings. 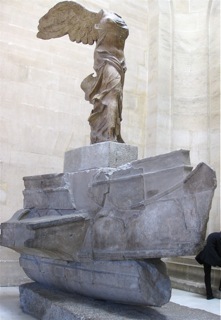 Occupying a strategic location at the top of a staircase, this graceful sculpture dates from the 3rd century BC. 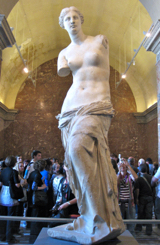 Here's where you'll find the Venus de Milo (known in Greek as Aphrodite of Milos), the goddess of love and beauty. Although she has a place of honor by herself, nearby halls offer wonderful collections of sculpture and other works of art. A beautifully decorated and ornate hall that contains the crown jewels and other gems. Michelangelo's The Dying Slave is on the ground floor sculpture gallery. From the Roman Empire through the Coptic Christian period to the coming of the Arabs. And remember, all of this is in just one wing of the Louvre. You may want to visit the Sully and Richelieu wings as well (they're all connected, and often you will pass from one to another without realizing it). Once you're there, museum maps can help you orient yourself. 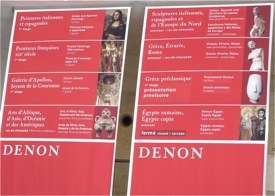 Below: Banners at entrance to Denon wing, Louvre. Above, Liberty Guiding the People, by Eugène Delacroix.